On the morning of this attack John O’Reilly came down this side road with his digger and started to knock a gap in the Daniels’ road side ditch. Having dug out the length of a gateway or more he then left, leaving the Daniels field open to their animals trespassing on the public road. Aghast, at this unexpected damage to their ditch, Norman and Hubert Daniels went down the side road and were in the process of repairing the damage when John O’Reilly attacked them. This is to be seen on the video. They were lured out of their farm onto the roadside for this unprovoked assault which left Norman with a fractured wrist and he subsequently had a heart attack. John O’Reilly is a violent supporter of the Kilkenny Hunt with a previous conviction for violent assault and he was fined 2250 euro, for this section 3 conviction for grievous bodily harm. Outside the court he was surrounded and supported by prominent members of the Kilkenny Hunt, for all to see. This assault is only one of a long list of intimidation, bullying and damage to their persons and their farming by the Kilkenny Hunt and their supporters, for which the Daniels have never been paid. Who was it that destroyed a field of silage with a harrow and stole their gates last Summer? Mr nobody. The government’s silence in this regard is alarming and they and the law are turning a blind eye when it comes to farmers. Further more, quite a lot of Solicitors, Barristers, Gardai and some Judges openly support this kind of criminal activity. Because these men, the Daniels are farmers, who cares? They were at law with the Devil, and the court in Hell, a waste of time and money. The men of 1916 died in vain. The Irish Farmers Organisation should be taking this case on behalf of two of their members and should be actively defending those men in Court. But because the IFA and the Farmers Journal have been infiltrated in the last number of years by high profile fox hunting people, whose aim is to perpetuate the Freebee, Hunt, with the Farmers investment at the Farmers expenses. Even the new IFA help line Solicitor James Stains runs with and defended the Kilkenny Hunt even in court, against two IFA members, the Daniels, what a laugh. The IFA’s own rules are not being operated. To highlight this, F A F T with the Daniels picketed the Farm Centre last April 15 2015 seeking the expulsion of all this gang .A press statement was issued, the Press took photos and interviews, but nothing appeared in the papers ,why? Is this gang about to be shafted from IFA? The power struggle is now on, the new President needs to be a strong and determined man. IFA’s rules state that no body is allowed to enter onto a farm unless they have the farmers permission and clearly in this case, the Hunt are trespassers doing criminal damage. Is nobody going to say stop? But in the face of this Redcoat Militia, we croppies will not lie down. Farmers Unite. Shut these gurriers out of your land. This entry was posted in Uncategorized on April 12, 2016 by farmersagainstfoxhunting. FARMERS against fox hunting have expressed “extreme concern” over a pack of hounds wandering onto a railway track during a hunt at the weekend where several dogs were killed by a passing train. The farmers’ group said it saw the incident as “yet further evidence of the havoc wrought by fox hunts” which it described as “an absolute menace to farmers and their livelihoods”. Iarnrod Eireann has confirmed that the 14.50 train from Waterford to Dublin’s Heuston station hit a pack of hounds on the track at Mullinavat, Co Kilkenny, just after 3pm on Saturday. A spokeswoman said the rail company had not been contacted prior to the fox hunt. The train ploughed into the pack of dogs killing a number of them. She said if they had been contacted they could have given the train timetable for the area but she also stressed that it was “very dangerous for people or animals to be on the track with trains passing at high speed”. In most areas the track was protected by fences or hedges and to be on the track was trespassing, she added. Chairman of the Kilkenny foxhounds, Ned Morris, said that he was away on Saturday and “only came back, so I don’t know how many dogs were killed”. He said that the group would normally contact Iarnrod Eireann prior to hunting. The company would be good about “slowing down trains and that kind of thing” when hunts were being held, he said. “Dogs getting killed would be a kind of freak thing now,” he added. The Association of Hunt Saboteurs disagreed and condemned the failure of the hunters to control the pack of hounds and protect their welfare. 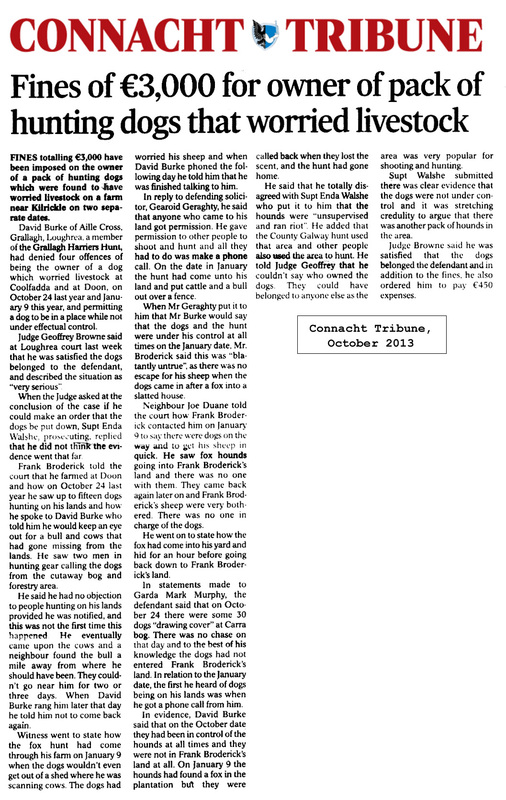 “The death of hounds while hunting is not an isolated incident. Accidents in the past have involved road accidents, other train accidents and deaths of other animals caused by hounds out of control,” said a spokesman. The Farmers Against Fox-hunting and Trespass group said it believed hunting should be banned. “Our main objection is the damage they cause to farm property. “They ride through fields of crops, ripping them up and scattering or killing livestock, knocking fencing and, as frequently happens, killing family pets,” the group said. This entry was posted in Uncategorized on January 15, 2014 by farmersagainstfoxhunting. We who are involved in animal welfare/rescue are up just as early as the so called ‘good fellows’ who take their perverted pleasure from persecuting and terrorising innocent animals in their habitats. We rescuers are up early picking up the pieces from this so-called sport. Apart from the foxes and all the other wildlife disturbed during these hunts, the hounds and the horses are often ill-treated by many of these great ‘custodians of the countryside’. How many hunt kennels would allow the general public/animal welfare people in to see what really goes on there, the puppies that are culled at birth for being the wrong colour, size, shape, etc. The old hounds that can’t keep up with the pack, old at three to four years of age. Where do they end up? And the horses injured out hunting, who takes care of them when they are no longer able to do the job required of them, in some cases carrying overweight men and women over long distances and over rough terrain? And what about the numerous domestic pets and livestock that are chased, mauled and killed by blood-thirsty hounds, bred to do just that? The group Farmers Against Foxhunting and Trespass have many a convincing tale to tell – give them a chance to tell the real truth about this so-called benign pastime. What puzzles me the most is the farmers who allow these hunts to cross their land, destroying fences and walls in the process. And the Department of Agriculture who allow horses and hounds traverse one farm to another, bringing disease and the potential for the snail that transports the Liver Fluke disease from farm animal to farm animal, not to mention other diseases. Hundreds of thousands of euro are spent each year by farmers on the treatment/prevention of Liver Fluke and many other diseases, it just doesn’t make sense. Blood sports should be banned and are in every civilised country. We are supposed to be the superior being, let us show that we are. Just because something is legal does not mean it is right. Let 2014 be the year we finally wake up to the realities of animal cruelty and what it means to us as a society. At a recent meeting of Farmers Against Fox Hunting and Trespass, a motion was passed unanimously declaring that ALL THE COMMERCIAL FARMING LANDS OF IRELAND SHOULD BE OFF LIMITS TO ALL HUNTING GROUPS WITH DOGS, WHETHER ON HORSEBACK OR ON FOOT. Access to farmland will only be by Written and Signed Permission from the Farmer/Land Owner. This measure is seen as necessary because almost all foxhunts erroneously claim to have permission to hunt on Farmland despite not having sought the farmer’s permission. The IFA, ICMSA and ICSA state that nobody has a right to enter farmland without the owners’ permission. Because of the NON payment for damage caused by foxhunts to farms, crops and livestock running into hundreds of thousands of Euro in all twenty-six counties, most farmers will no longer grant permission to Hunts to enter their lands at all. The 30,000 Euro owed to a Westmeath farmer by the Hunts for the loss of his Pedigree Herd of Sheep, has still not been paid to the man. Incredibly, the 30,500 Euro that was awarded in Kilkenny Circuit Court last year for Criminal behaviour by the Kilkenny Hunt has still not been paid to the Daniel brothers of Tullaroan Kilkenny. On top of this despicable behaviour, hunt hounds are routinely killing farm family pets, harmless little cats or dogs that happened to show themselves when the Yahoos arrive with horns blowing and whips at the ready. The animals are savaged in front of crying children and helpless adults as the hounds run amok in a frenzy. We ask: Is there no Justice for Farmers victimised by foxhunts? This kind of Wanton Vandalism has to stop. Hence, the decision taken by members of Farmers Against Foxhunting that in Future, ALL Hunt clubs will have to carry Written and Signed Permission from the Farmer on whose land the are found. NO PERMISSION MEANS JUST THAT… NO ADMISSION TO THE FARM BY FOXHUNTS. Our members will resist with all the legal means at our disposal any and all attempts by hunts to encroach on farm property. WE CROPPIES WILL NOT LIE DOWN! This entry was posted in Uncategorized on December 13, 2013 by farmersagainstfoxhunting. Irish agriculture is reeling under the impact of events and activities that undermine its morale and viability. We have had the scandal of processors inserting questionable additives and horsemeat into burgers that ended up in Irish supermarkets. This at a time so many horses in the country are neglected or abandoned, the often emaciated creatures having to be rescued from the direst conditions by animal rescue groups, with no ID Tags to trace the owners. The huge bill for their disposal is passed on to the taxpayer. Where is the justice in this? One wonders what use are all the rules and regulations imposed on the Irish farmer relating to Safe Food, the keeping of which is a condition for CAP payments. Farmers have had some good news too: Recently two Kilkenny farmers, after years of being bullied by foxhunters, were awarded Eur30,500 in damages against a hunt official in Kilkenny Circuit Court. Norman and Hubert Daniels of Tullaroan, County Kilkenny have the gratitude of their neighbours, and commercial farmers nationwide. They have to be admired for their courage and determination, as they driven to desperation owing to the constant verbal abuse and damage to their farm property over the years. Had they not videotaped the hunt activities, they might never have achieved justice. Hunts have caused extensive damage to farms nationwide, and the judiciary has not proven to be the farmers’ friend in many instances. The late judge, Frank Roe for example, dismissed numerous claims made by farmers for hunt-related damage. Another judge who happened to ride with a hunt himself dismissed a claim for the total destruction of a pedigree herd of Suffolk sheep. The damage cost the farmer in question £30,000. To this day he has not been compensated for his loss. The scandal and injustice of hunt trespass has to be face up to once and for all. Breaking and entering and vandalising a person’s property is, in law, a criminal offence, perpetrated by criminals. The fact that they wear fancy costumes does not alter this legal reality. Let’s stamp out hunt-related crime. Hundreds of claims by farmers for damage caused by hunts are outstanding and there is no sign of the hunts paying up. Can TDs and senators be so deaf or blind as not to realise the importance of banning this destructive and pointless cruelty to farmers? They fail to legislate against foxhunting while horses, packs of hounds, and hunt followers (some riding quads) are rampaging across the countryside, wreaking havoc on legitimate farm enterprises as they knock fences, scatter livestock, churn up fields of crops and destroy productive farmland in the middle of winter? Fox hunting displays a callous disregard for binding EU requirements and good farming practice. It is rightly banned in the UK, a country that relies far less on agriculture than we do. Dail Eireann must act to banish these pests from rural Ireland. True, there are some farmers who join hunts, but without exception these people will not damage their own land but they will ride roughshod over someone else’s. If the Tally-ho brigade were to switch to drag hunting they could lay false trails for the hounds to follow, thus avoiding trespass and damage to farms. They could make that change at any time. Unfortunately they prefer what they call “that essential element of unpredictability” as one hunt master described it. An outright ban therefore will be required to end this rural vandalism. Gleann an Ri, Mallardstown, Callan, Co Kilkenny. This entry was posted in Uncategorized on May 3, 2013 by farmersagainstfoxhunting. Irish agriculture is reeling under the impact of events and activities that undermine its morale and viability. We have had the scandal of processors inserting questionable additives and horse meat into burgers that ended up in Irish supermarkets. This at a time so many horses in the country are neglected or abandoned, the often emaciated creatures having to be rescued from the direst conditions by Animal Rescue groups, with no ID Tags to trace the owners .The huge bill for their disposal is passed on to the Taxpayer. Where is the justice in this? One wonders what use are all the rules and regulations imposed on the Irish farmer relating to Safe Food, the keeping of which is a condition for CAP payments. Farmers have had some good news too: Recently two Kilkenny farmers, after years of being bullied by foxhunters, were awarded 30,500 Euro in damages against a hunt official in Kilkenny Circuit Court. Norman and Hubert Daniels of Tullaroan, County Kilkenny have the gratitude of their neighbors, and commercial farmers nationwide .They have to be admired for their courage and determination, as they driven to desperation owing to the constant verbal abuse and damage to their farm property over the years . Had they not videotaped the hunt activities, they might never have achieved justice. The scandal and injustice of hunt trespass has to be face up to once and for all. Breaking and entering and vandalizing a person’s property is in law a criminal offence, perpetrated by criminals. The fact that they wear fancy costumes does not alter this legal reality. Let’s stamp out hunt-related crime. Hundreds of claims by farmers for damage caused by hunts are outstanding and there is no sign of the hunts paying up. Can TDs and Senators be so deaf or blind as not to realize the importance of banning this destructive and pointless cruelty to farmers? They fail to legislate against foxhunting while horses, packs of hounds, and hunt followers (some riding quads) are rampaging across the countryside, wreaking havoc on legitimate farm enterprises as they knock fences, scatter livestock, churn up fields of crops, and destroy productive farmland in the middle of winter? Fox Hunting displays a callous disregard for binding EU requirements and good farming practice. It is rightly banned in the UK, a country that relies far less on agriculture than we do. Dail Eireann must act to banish these pests from rural Ireland. True, there are some farmers who join hunts, but without exception these people will not damage their own land other farm property their own land…they will ride roughshod over someone else’s. If the Tally-ho brigade were to switch to drag hunting they could lay false trails for the hounds to follow, thus avoiding trespass and damage to farms. They could make that change at any time. Unfortunately they prefer what they call “that essential element of unpredictability” as one hunt master described it. An outright ban therefore will be required to end this rural vandalism. This entry was posted in Uncategorized on February 15, 2013 by farmersagainstfoxhunting.